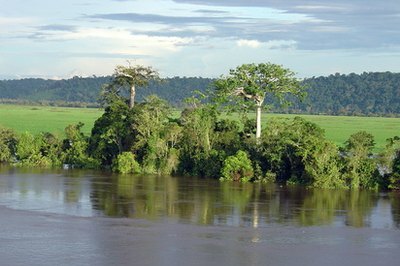 The Orinoco river in Venezuela is a home to guppies. The guppy is one of the more popular aquarium pets. This small, tropical freshwater fish is easy to care for in an aquarium and can tolerate conditions that are different to those in his natural habitat. Creating a suitable aquarium habitat for your guppy is a relatively easy task. In the wild, your guppy is typically found in the clear tropical waters of Caribbean islands of Trinidad and Tobago, and on the South American continent in Venezuela, Guyana and Brazil. He also likes brackish water that is more saline or salty than fresh water, but not as salty as sea water. In the wild your guppy feeds on worms, shellfish and insect larvae, and his fondness for mosquito larvae is one of the reasons this fish is introduced to lakes and ponds in some Asian countries to control the malaria-carrying mosquito population. The pet male guppy is known for his bright colors, but in his natural habitat he is more likely to be a duller color, which protects him from the attention of predators. A guppy can survive in water temperatures as 55 degrees Fahrenheit, but ideally you should keep him in water with a temperature of 72 to 79 degrees Fahrenheit. Some salt in his aquarium water is helpful for reducing fish stress levels, but maintaining his mineral intake is more important. He is able to absorb higher levels of calcium, magnesium potassium and sodium in water with a higher pH level. Tropical freshwater fish like the guppy tolerate a pH measurement in a range between 5 and 9, although your guppy prefers a pH in your tank that is closer to between 6.8 and 7.5. Because the male guppy only grows to 1 1/2 inches and the female to 2 inches, you can keep guppies in a small tank. However, the size of the tank depends on the number of guppies you have and the needs of other species you have in your aquarium. American Aquarium Products recommends allowing 2 1/2 gallons of water per pair of guppies. However, the site also points out that this will not be enough if you have male and female guppy pairs as this quantity of water isn't enough to accommodate the number of offspring this pair of guppies will produce. When choosing a tank for your guppy, Aquarium Explorer suggests you buy a long tank as this gives your guppy more swimming space. He also prefers a well-lit tank with plenty of aquatic plants at the sides and back of the tank. Because your guppy is a very peaceful fish, it is best to avoid keeping him in the same aquarium as more predatory, aggressive fish. Ideally, you should keep him with fish that are a similar size to him and who like the same water conditions.